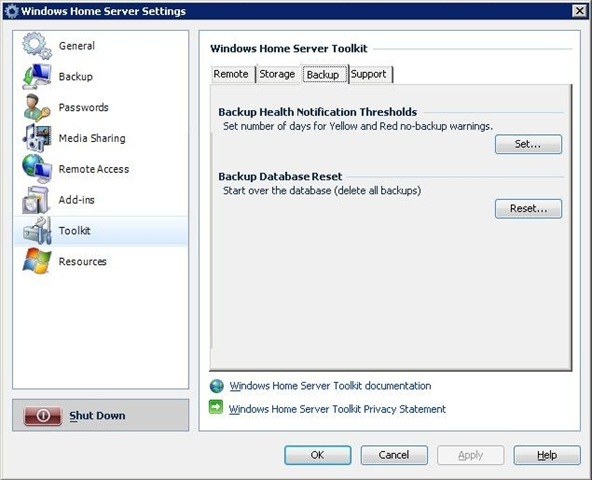 As you've probably seen from Robert McLaws' blog post, there's a new Toolkit for Windows Home Server. There are several components to this. Some run in the WHS Console as an Add-in, and others can be run locally on the client, or the server. The Console Add-in gives you a new item under Settings, labeled Toolkit. From there you have 4 available tabs. Remote, Storage, Backup and Support. 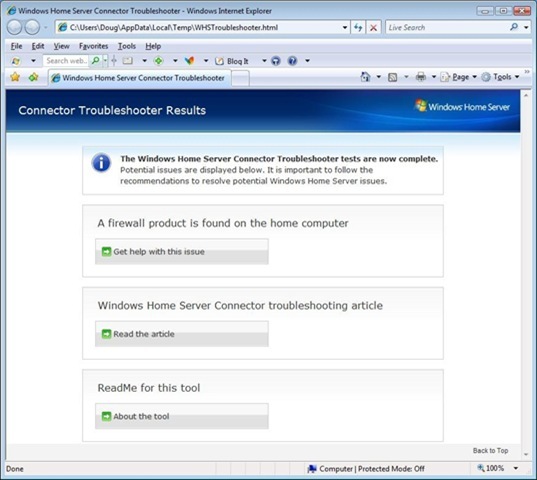 The Remote tab gives you access to tools to help with troubleshooting and configuration of the Remote Access web site. Of particular interest is the Remote Access Website Configurations button. Here you can adjust the Session timeout of a Remote Access connection. The default value is 20 minutes for an idle connection. This can also cause large downloads and uploads to fail. You can change this value up to 24 hours. 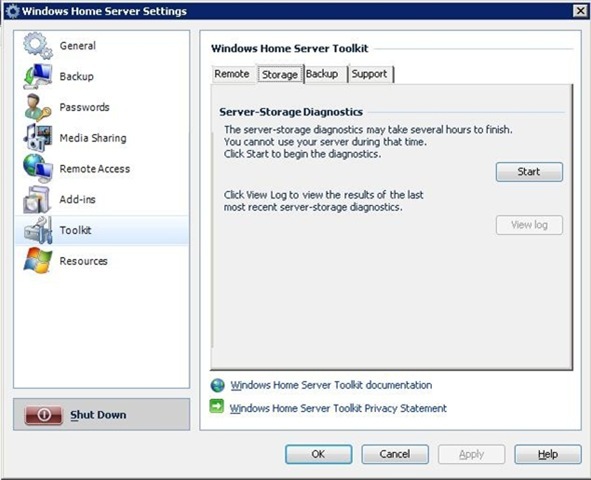 The Storage tab gives you access to diagnostics for server storage. 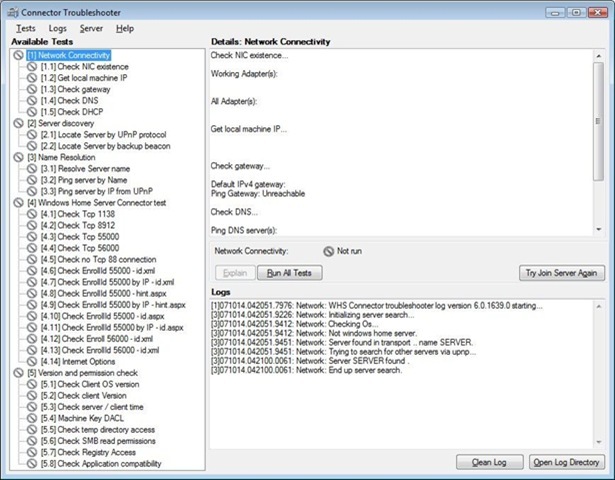 And after you run the diagnostics, you can view the log. The Backup tab allows you to wipe out the backup database (yes, this deletes all backups). 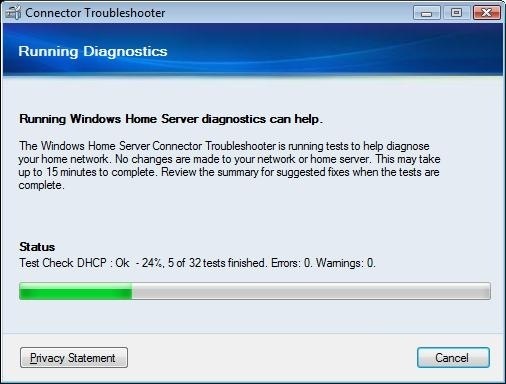 This could help you recover from a problem that might require a full re-install to correct otherwise. 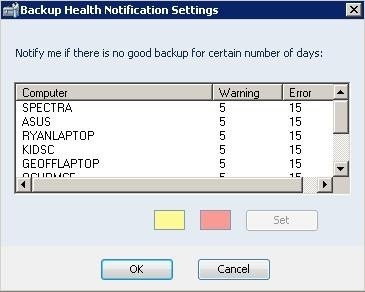 And you can change threshold in number of days before WHS will start nagging you about a client not being backed up. And very cool, it apparently can be set on a per computer basis! So, if you have kids that are out of the house all week and their laptops are only home on Sunday, you can change their settings to accommodate their lifestyle. 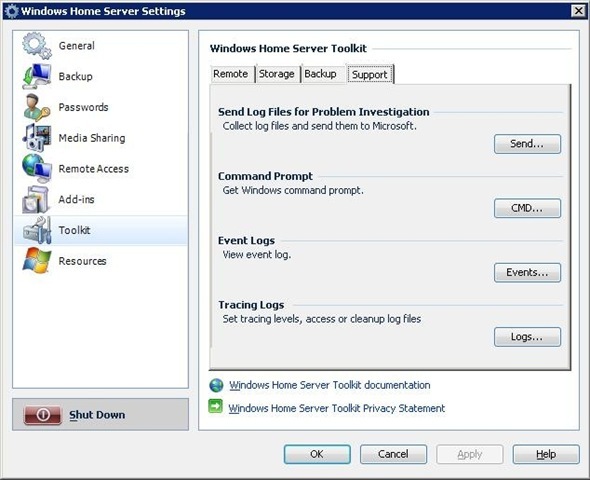 The Support tab gives you the ability to upload the Server logs to Microsoft to help them assist in troubleshooting issues. You're given the CAB number to provide to MS so they know what file to look for. Its basically a GUI presentation of the TalQ diagnostic tool from the beta days. You can also get a Command Prompt window, directly from the WHS Console and view the Event and Tracing logs that are relevant to WHS. Click on the Server menu bar item and you'll see Publish Server Add-in. This automatically sends a copy of the relevant MSI file to the \\Server\Software\Add-ins folder, so you don't have to do it manually. 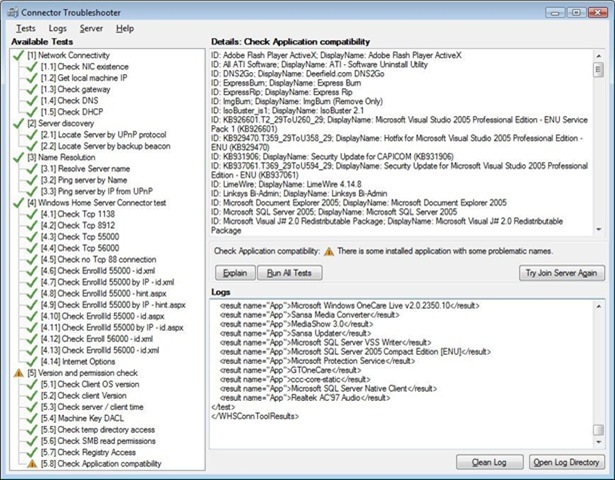 Now, you can see here, that everything went fine until it got to the Application compatibility check. It seems that it doesn't like the name of one of my installed programs, but I couldn't find anything the indicated which one it was! And now for the good part. Here's where you get it!! Now for the bad part. 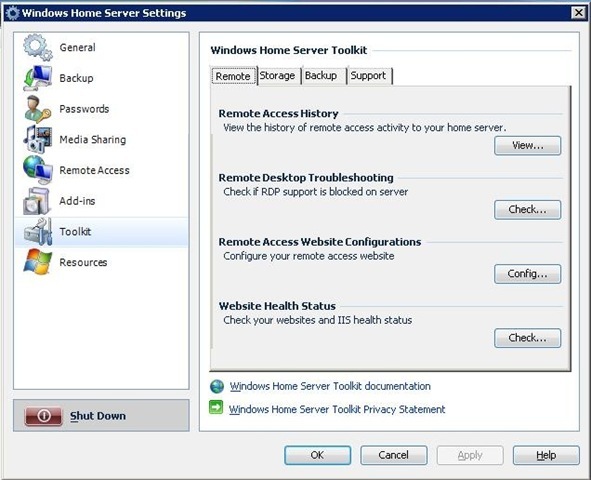 According to the documentation, the Toolkit should install as a WHS Console Add-in, the same way all the other Add-ins are supposed to install (copy the MSI file to the \\Server\Software\Add-ins folder, then open the WHS Console, go to Settings, Add-ins, Available and install it. I could not get it to install this way. However, I finally just used Remote Desktop to access the server, navigated to the \\Server\Software\Add-ins folder and double clicked on the MSI file and it seems to have installed itself just fine.